It’s the first day of Saturnalia! 😀 Thought I’d show the end result of my last mani for the holiday nail art challenge. The menorah actually lasted all 8 days of Hanukkah, and I “lit” another candle on it each night using my gel pens. I also kept the middle finger with the sun, although the nail had a break on the side so don’t mind its appearance! 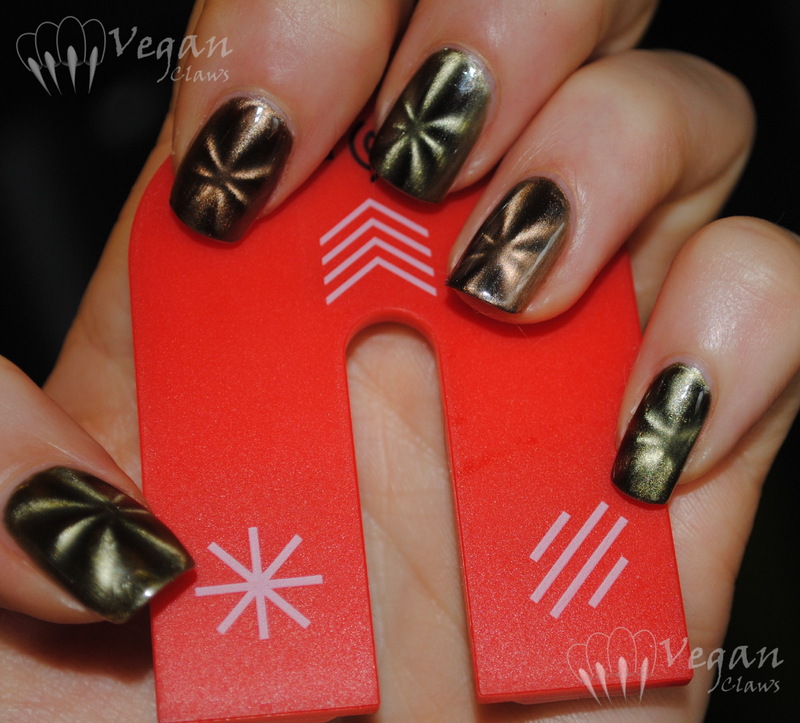 On the other fingers, I have China Glaze Gold Fusion, a golden magnetic polish that I used a wavy-lines magnet on. Overtop of that I added No Miss Sand Glitter, a gold glitter that’s actually in the shape of tiny rectangles. Then, over that, I added a very thin layer of OPI Goldeneye for a little bit more of a yellow-gold tint. I picked up two of the China Glaze Magnetix polishes a couple of months ago, Cling On and You Move Me (green and brown respectively), along with the China Glaze magnet. Here is the alternating mani I did with these two polishes. Photos are all indoor with flash; it was very overcast when I took them and the non-flash photos I took didn’t show the magnetic designs very well at all. I used two coats of each polish, one as a base layer and then used the star magnet over the second coat. I added top coat before taking the photos. I’ve heard that many people don’t like the China Glaze magnet; personally I thought it was fine and didn’t really have much trouble using it, but then again it’s the first magnet I’ve used aside from this one strong fridge magnet I have! As you can see I did have a bit of trouble with centering the design, especially on the pinkie, though. 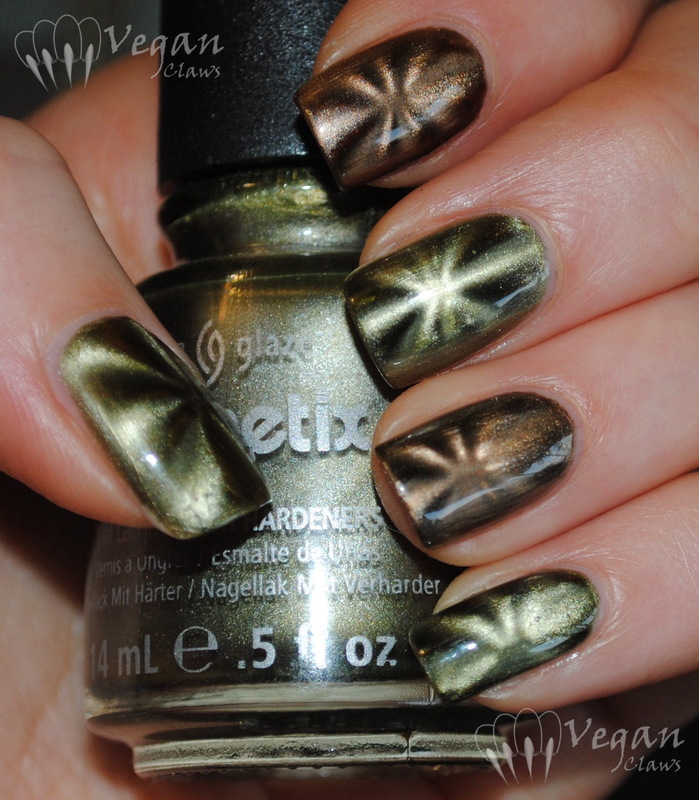 I haven’t tried the other two designs on the China Glaze magnet, just the star. I didn’t really like these polishes as much as I thought I would, especially the green. It seems weird to say since the magnetic design does give an illusion of depth and texture, but the colour on that one just feels flat to me. Maybe if it had a bit of golden shimmer in there somewhere… Maybe I need to try it by itself and with the other magnet designs. The brown one, You Move Me, I do kind of like. More recently I got one of the Color Club magnetics, the coppery one, and I have a feeling I’ll like that one better; it looks like the shimmer has a lot more depth to it!